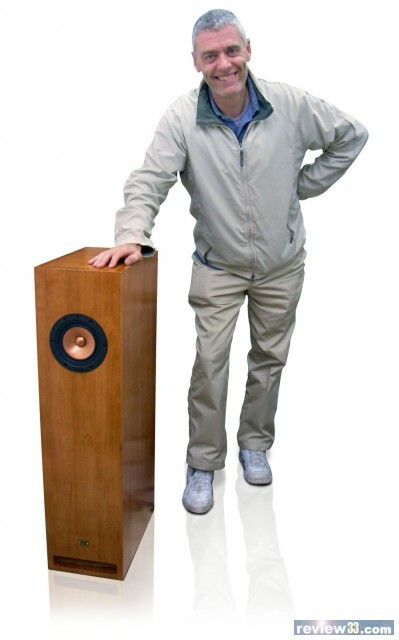 There is an inherent attraction to single driver, full-range loudspeakers in that it is fits with the “straight-wire” camp of thought where less is better. The amplifier output is directly connected to the windings in the voice coil, and the power-train responds gracefully to all the frequencies in the audio signal. In the design of the full-range driver, there is also a “purist” approach of using a single surface to cover the entire frequency range. (Many full-range drivers utilize a “whizzer” or a plug – which constitutes a second surface, to handle or enhance the higher frequencies). 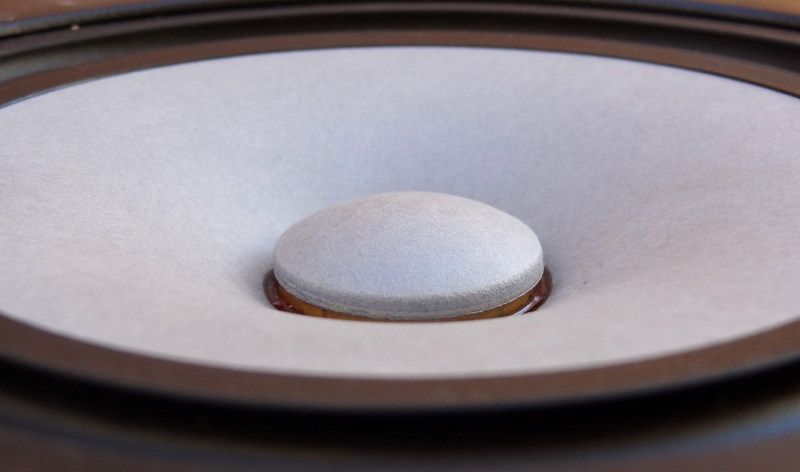 The challenges in this approach become increasingly difficult as the designer tries to extend the low frequency response by increasing the size of the emitting surface and at the same time improve the high frequency response by reducing its mass. One can readily appreciate that size and mass not only go hand-in-hand (bigger size, bigger mass) but the structure must also have enough strength and rigidity to keep its form through repeated motion for endless hours. 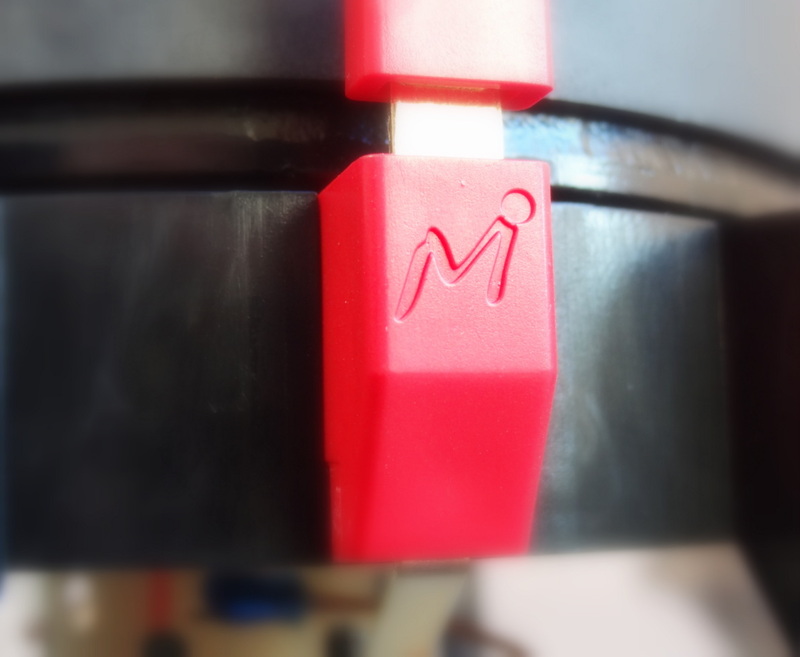 MarkAudio, a small company established in Hong Kong, has mastered and conquered these challenges and has delivered its most up-to-date technology in the Alpair 12p driver. With constant dialog with end users gathering requirements/wishes from the audio community and by utilizing the latest materials, manufacturing technologies and unconventional design ideas, MarkAudio has produced a stellar product. As it apparent, I have become the proud owner of a pair of MarkAudio’s Alpair 12P full range drivers. The Alpair 12P is the latest generation of the Alpair 12 series. It is designed base on customer feedback and requirements and incorporates the most advanced ideas from MarkAudio to date. The driver was released in mid-June of 2012 and although it is classified as “Generation 2”, time-wise it coincides with “Generation 3” technology. I much enjoyed the time I spent with Ted Jordan. I have much admiration for his stamina and spirit. Ted is of the traditional school of British design, something sadly that is fast disappearing. Ted and me had our good times and our not so good times, sadly our association was not destined to last. We had markedly differing ideas on cone and other key component design. To be fair to Ted, I was the one who eventually pushed for radical development of lower mass power-trains using new materials and shallow profile cones, with all the inherent production, operational and financial risks. 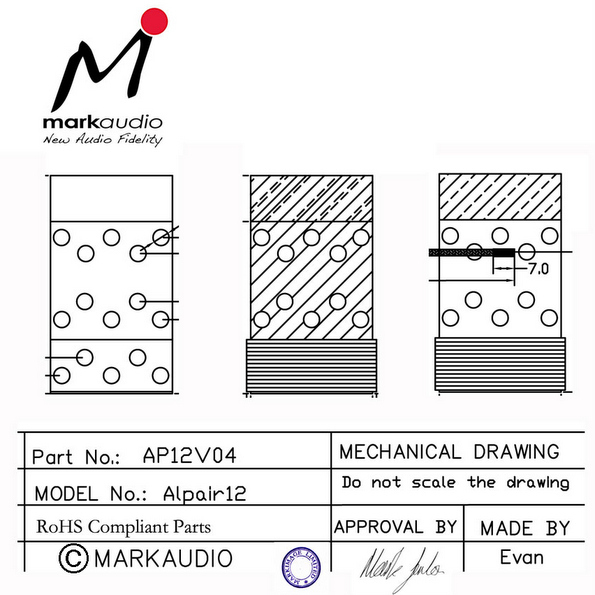 It became inevitable that we part our ways and so Markaudio was born in its own right. For the last 2+ years, Matsubara san, the farther designer of the Fe series has been my great supporter. I well remember our first meeting where I showed him the Alpair 12 prototype, with its ultra thin front suspension, incapable of supporting the cone, he told me I was absolutely nuts to attempt a single mechanical suspension driver of this size! But he listened to my plan, poured over my drawings and we came up with the mother of all rear suspensions. A few weeks later, he came to a Markaudio listening event in Hong Kong and was bowled over by what he heard. The rest is history as the saying goes. As important is Evan Yu. This guy has been my right-hand man for the last 5 years. He’s one of these guys you need in any factory to get things done. He also a descent conventional driver designer in his own right. He also thinks I’m nuts at times, but he knows me well enough to give pretty much all my ideas a fair go. More recently, I’ve had the pleasure to work with Jeff Tanigichi san and Kitagawa san, 2 first rate audio product engineers. Many an hour is spent debating over all sort of developments, from custom connectors to changing over to fused spider mounting systems, you may imagine some of the daily conversation, but its worth it in the end. I hope our pioneering spirit continues and home custom speaker builders continue to invest their confidence in our work. My hearty thanks to all the guys that have bought and used Markaudio drivers, as without this support, Markaudio couldn’t exist. My hope is that we gradually spread more confidence in Full-Range drivers. 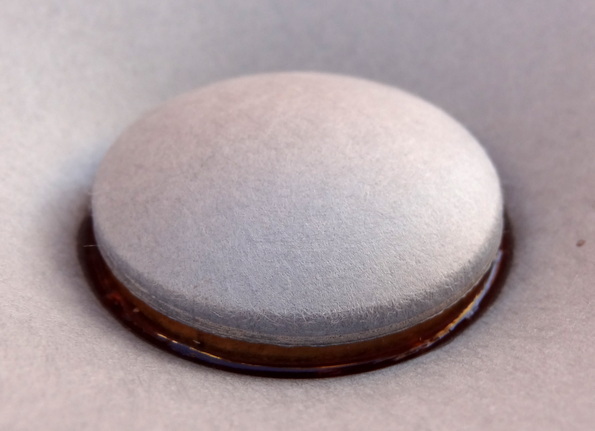 I believe there is a big future for single point source, single cone full-range emitters. I’m glad of all the help, support and encouragement as we’re still a young company with hopes to make into main-stream audio some day in the future. In order to appreciate the advances embodied in the Alpair 12p, it is important to understand what are the things that would make a good full ranger. Number 1: A relatively rigid cone form is needed to maintain the LF (low range) oscillatory function (stability) of the power-train (front suspension, cone, cap, coil and rear suspension). Some flex in a low-mass cone is inevitable and needed for the resonant functions. Control and balance between these 2 functions (rigidity and flexibility) is critical, material selection plays an important role in this design element. The second and third design elements are particularly critical. The larger the cone gets, the greater its mass, the harder it gets to make it resonate. Mass is the limiting factor at play for primary mid-high emittance. Hence why it takes me longer to modify and improve the larger single cone drivers, and why most designers give up and deploy whizzers and phase plugs. The third element is where I’ve spent allot of design time these last 3 years. The cone profile is not only critical for oscillation, but more so for resonance. The ability to allow the passage of a wave signal is fundamental. The profile (shape) is also critical to the design of the dispersion characteristic. 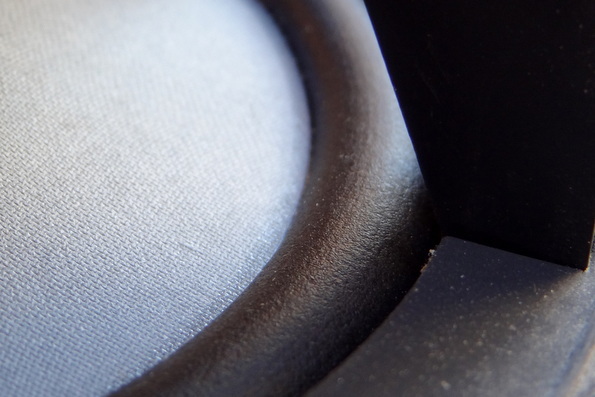 Some of you may have noticed Markaudio driver cones are becoming more shallow (lower profile). This design factor improves mid-high primary emittance and increases dispersion. However, there are limits as the stability of the power-train remains important. The 4th, 5th, and 6th design elements are sub factors specific to the design processes relating tooling and press production. Its takes allot of time and effort to get all the elements working together to make a single cone emit full-range (to 20-kHz+). Mass is the enemy of making a driver go “full-range” yet it is needed in order to maintain mechanical/operational stability. Effectively the cone cannot act as a rigid piston at all frequencies, so “breaks up” and effectively becomes smaller at higher frequencies. This breakup will show as resonances which will result in peaks and troughs in the frequency response, as can be seen in any driver, not just wide range units. This is a very simplistic statement, and the challenge to the designer is to minimise the unwanted effects that result. The normal approach is to avoid using the driver in the range where this happens. To get bass, a large cone must be used, so for these another way is to create a discontinuity in the cone so the cone becomes “smaller” at a frequency chosen by the designer. Hence the use of whizzers, but these have their own unwanted resonances. An extreme case was used by Hartley, who placed a flexible coupling between the inner and outer sections of the cone. This prevented the whizzer type resonances, as the edge of the treble section was now supported, and damped, but introduced a deep narrow trough in the frequency response. …Designing an electro-acoustic driver power-train is very complex, much more so that simply thinking in terms of excursion V the mass issue.We have to remind ourselves that the input to the driver’s power-train is non-linear, varying in frequency and amplitude. 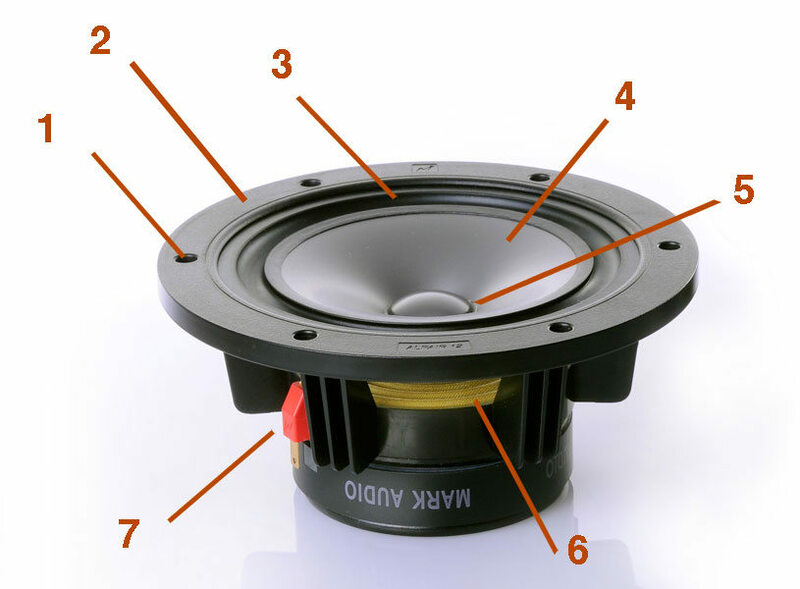 Traditionally, high SPL drivers with short coils have a short usable X, relying on the design of the box to extend LF emissions by wave lengthening. For LF emittance, this driver type is mostly limited to use in LF extended gain box designs (horns etc. ), most quite physically large, not particularly practical for many hobbyists. Such drivers also are vulnerable in terms of their linear excursive capacity; Said capacity easily being exceeded even by a moderate increase in input signal strength, the result is increased distortion at close to limit of the driver’s in-gap coil stroke. I realized along while back that there was potential for creating a power-train with a longer throw (X) that could mitigate the limitations of short X drivers provided the relative low mass of the power-train components could be retained. Having worked on this concept for several years, we are now at the point where relatively long stroke power-trains with low mass wide long-wound coils give the driver greater linearity when driven by LF inputs. The concept is more flexible, allowing for less critical box designs; And the greater use of a wide variety of box types. This concept is still low-power. 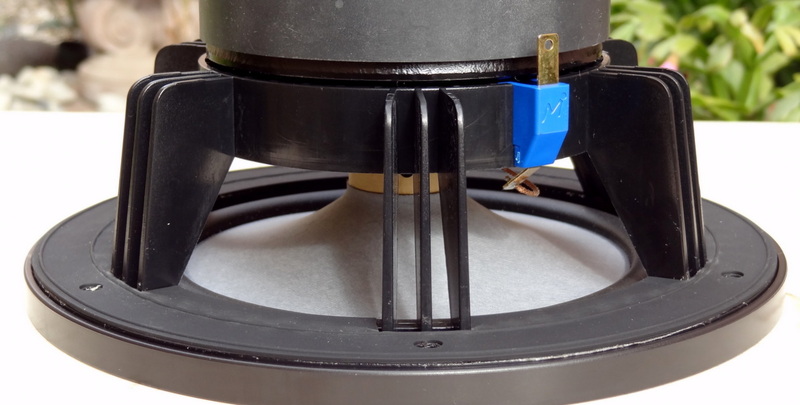 Its not designed to be a replacement for a woofer, but it is designed to more accurately emit non-linear LF loads that drivers with short coils cannot. Historically, this was a major part of my efforts to extend the bandwidth of single point source Full-Range drivers. All new Multiform cone. The low mass, mixed alloy material is very thin, less than 0.11-mm on the critical sections along its profile. To our knowledge, the Alpair 12 is the only current production driver of single cone, single cap 8″ design, capable of reaching 20-kHz at 87dB. 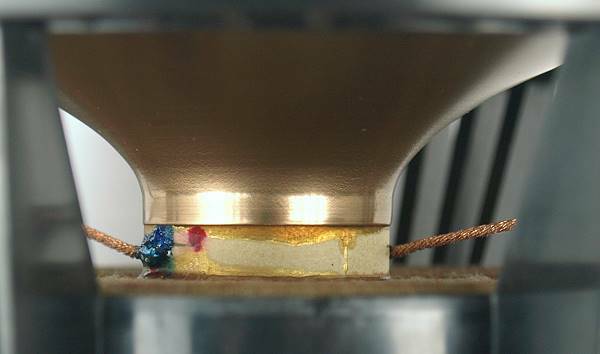 The cap is now directly bonded to the coil former using a A/B bonding method. Strong and efficient method for the transmission of middle and high frequency responses. The spider is a custom design. Its profile and the suspension shapes are specific to this driver. This spider makes a significant contribution to the fast response of the Alpair 12. New connector system has been design for easy installation and optimized to provide the damping of the leads that run to the coil. Type: the paper cone is the same as the one developed for the Alpair 6. The paper is of Japanese origin with Taiwanese production (KK and BKH mixed fibre papers). The Multiform process has been taken a stage further so much of the forming is now double pressing. Note the color. 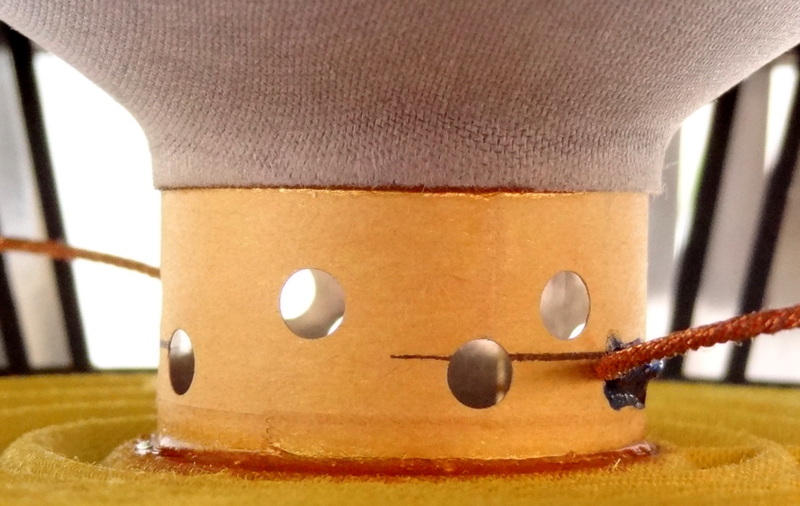 The dyeing process is critical to rigidity of the cone, along with reduced mass. The change to a custom paper cone with a more shallow profile reduces mass and increases dispersion performance. The new cone is only 21-mm deep compared to the metal unit at 26-mm. The emittance properties in the upper-mid to high range on larger paper cones drops off more than metal. The bigger the paper cone, the more challenging getting it to emit high range. On the plus side, paper is often considered to be more “mellow” in the low-mids while retaining detail if the designer sticks to a low-mass design. 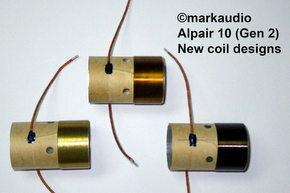 Here it is compared to the voice coils for generation 2 Alpair 12s and generation 2 Alpair 10s. Notice the new coils are longer and have more holes for lower mass. TIL (a type of fiber/resis) coil prototype: The driver’s T/S data is looking quite good. SPL is +92dB while Qts is 0.3 which hopefully will make it easier for a variety of box designs. 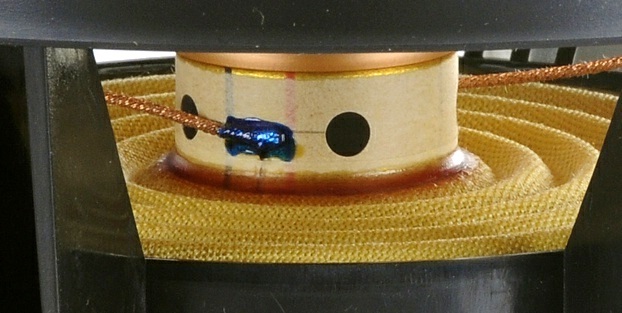 However, typical of TIL bodied coils, the transfer properties to the cone neck are more variable compared to Alu and paper coil bodies. The result is a frequency spectrum is more variable with some larger peaks coming in the upper mid-band. This coil type can exert increased micro-reasonant extension and compression. I haven’t had time to run my tests, but looking at the frequency, I suspect this driver could sound a tad shrill. Can’t really tell at this stage as I wasn’t at the factory today. At least we are at the stage where this prototype was gone almost full-range (-7dB from mean @ 20-kHz), pretty good for a single paper cone of this size with no whiz or phase plug assist. I’ve not had time to generate the Impedance graphs but observing the peak at resonance, it reaches 145 Ohm, high and typical for this coil type, that might not suit some tube amps. Alu coil prototype: This driver gives me more excitement. 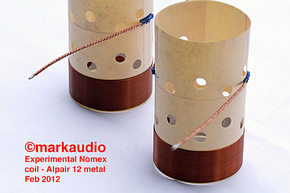 Normally, I wouldn’t expect an Alu coil body to generate enough transferable resonant energy to get a single paper cone design of this size over 12 to 14-kHz. Effectively, we might say this driver’s going full range as it gets to 17-kHz before falling off. Alu coil bodies have a higher material damping factor, so we’ve the better looking frequency response of these 2 prototypes. Overall, its frequency spectrum is the most controlled with SPL peak-dip +/- variations of around 4dB, good for drivers of this size and type. Also of interest is the mms, at 9.775 grams its close the much lighter TIL proto than I anticipated. As a result, the Alu prototype’s SPL gets above 92dB. Also, its Impedance peak at resonance is 60 Ohm and relatively flat, should suite allot of lower power tube amps. However, its power-train does have some increased damping so QTS is lower than I hoped @ 0.277. Depending on which box calculation software used, something around a 15 litre BR looks feasible. At this early stage, this prototype looks the most promising. The front suspension is made of a rubber material and it feels very thin to the touch. It is bonded/glued to the paper cone and the frame. The small mass of the suspension is in line with the goal of reducing the overall mass of the power-train. I think the front suspension is similar to the one used in the 12 (metal cone). Typically, front suspensions have enough rigidity to level and support the cone when being installed into the power-train. But there’s a catch. Thicker front suspensions add mass and often introduce increased non-linear motion. This is due to process and heating differential limitations when making suspensions that require larger volumes of material. Often, the outcome will be variations in the flex-stiffness ratio in various locations within the piston wall of the suspension (rounded section of the component). Such variation aren’t normally an issue for commercial grade drivers, or Full Rangers with limited Xmax. However, for drivers with low mass power-trains, wide frequency generation and larger excursions, the tolerance and mass of this component becomes service critical. The spider of the 12p is an improvement over the spider design in the original Alpair 12 which itself was a unique design for the driver. The mechanical properties of the convention spider delivers a particular resistance proportional to a given X load point. This has some drawbacks. The first is a non-linear damping effort while overcoming the inertia of the power-train, particularly at the initiation of a LF oscillation. Makers jargon sometimes names this effect “rolling bounce”. Second and more important is the design may offer little control towards the limit of excursion. 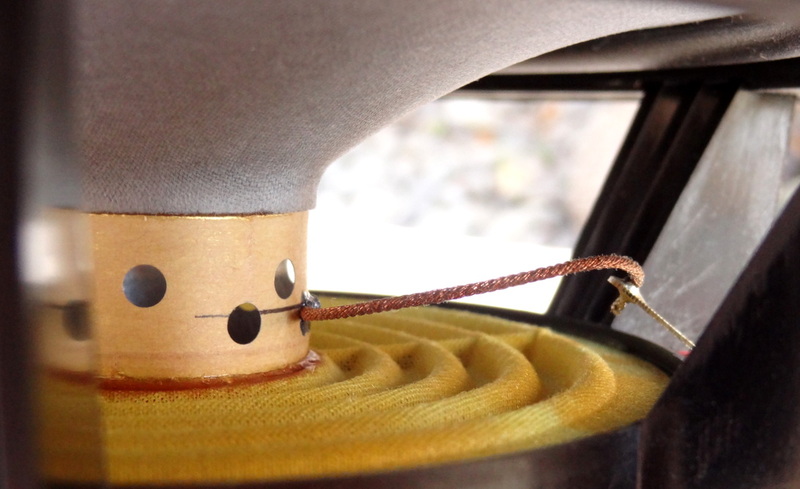 Many of us have driven a woofer to a point where the coil has hit the back the the yolk plate. Most makers try to overcome these challenges by simply making a stiffer spider but this approach while partially solving the resistance challenge, creates others (sorry no time to go into this now). 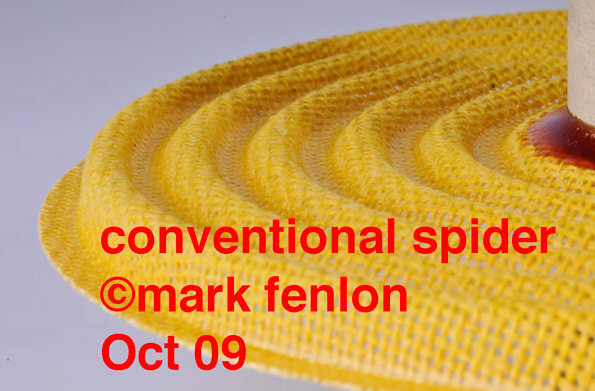 Here is a photo of a “conventional spider [link]. Notice the uniform rib profile and separation. The Alpair 12’s spider is different. It is designed with a specific resistance profile. There is moderate resistance on short X-LF loads. Going through the normal operational range, the resistance profile continues to be proportional to the loads, then stiffens near the limits of the excursive load. Since the front suspension is extremely soft compliance, the spider operates the significant part of the load damping and maintains the oscillational stability of the power-train. The Alpair 12p spider adds radial “bridges” to the concentric rib profile of the Alpair 12, in order to increase its rigidity. The 12p weaving seems finer as compared with the 12. 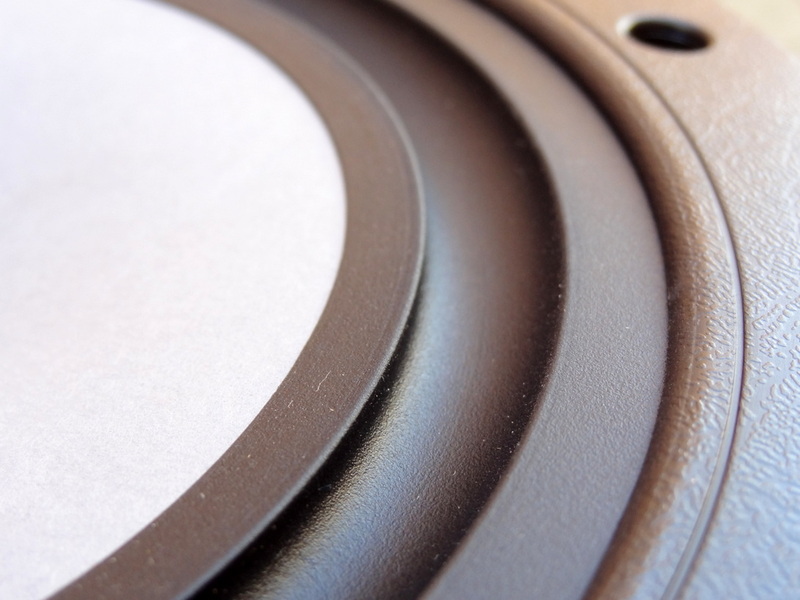 Made of “anti-resonant” material to minimize transferring vibrations to the cabinet. 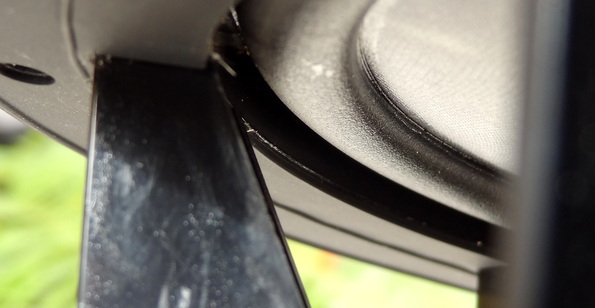 An incorporated rubber gasket further helps minimize vibrations. I’m concerned about the tinsels on the later photos – why on the earlier photo they’re bent out perpendicular to the axis of motion, but on the later ones they look much too tight (not long enough) ? As mass is an issue, wouldn’t thinner tinsels help somewhat? On the drive units I’ve seen the bend (flex) is normally in the same plane as the axis of motion. Yes, there is a metal cone in the works. 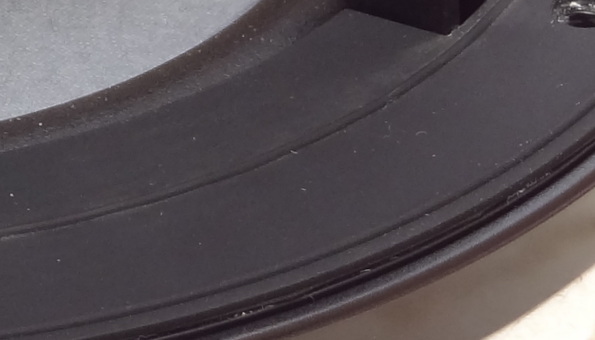 The previous generation of the “12” was also a metal cone, but getting the sensitivity up, they switched to paper. I have a bookshelf cabinet that I bought form the another member in diyaudio. I am the happy user of the latest generation 12p driver. Ive placed it in a home made blh, horn length about 2 m . I ve had a lot of loudspeakers over the years, but never had such a musical playback quality before. Everything is very lifelike, very organic, and yepp they keep on improving all the time! I’m planning to build a music (L/R) speakers as well as centre channel using the 12P, all real loaded horn. The rear channel speakers will be much smaller rear loaded horns. All the front speakers will use the same drivers so they match, tone wise, and I was originally thinking of the 10P drivers. Have you any experience with the 10P as I am curious if if the 12P is noticeably better, some forums suggest it is not. I would like to know about your real loaded horn design process if you have the time.